Based on component, the global telemedicine technologies and services market has been segmented into hardware, software, and services. Rapid expansion of the global telemedicine technologies and services market is attributed to increase in innovations and technological advancements in telemedicine products, increase in incidence of chronic conditions and adoption of telemedicine solutions, rise in geriatric population to propel demand for telemedicine solutions and surge in prevalence of long-term care conditions coupled with rise in demand for self-care. The global telemedicine technologies and services market has been segmented based on component, specialty, services, and country. In terms of component, the market has been classified into hardware, software, and services. In terms of specialty, the global telemedicine technologies and services market has been categorized into dermatology, gynecology, neurology, cardiology, orthopedics, emergency care, internal medicine, and others. Based on services, the global market has been divided into tele-consultation, tele-monitoring, tele-education, tele-training, tele-care, tele-surgery, and others. In terms of country, the global telemedicine technologies and services market has been segmented into the U.S., Germany, the U.K., France, Italy, Spain, Russia, Sweden, the Netherlands, China, India, Australia, Singapore, Brazil, Saudi Arabia, South Africa, and Rest of the World. 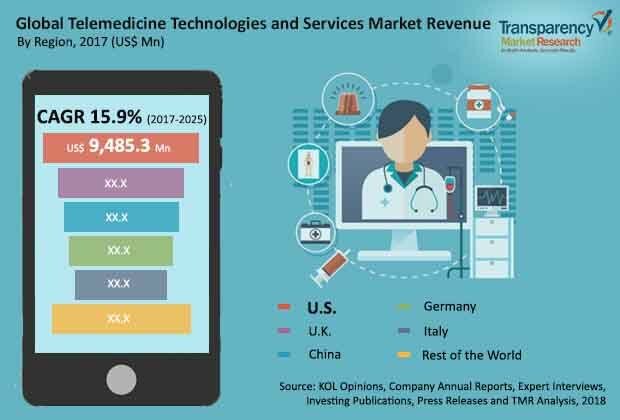 The report is a combination of primary and secondary research, conducted to understand and arrive at trends used to forecast the expected revenue of the telemedicine technologies and services market in the near future. Primary research formed the bulk of the research efforts, with information collected from in-depth interviews and discussions with a number of key industry experts and opinion leaders. Secondary research involved study of company websites, annual reports, press releases, investor presentations, analyst presentation, and various international and national databases. The report provides estimated market size in terms of US$ Mn for component, specialty, services, and country for the period 2015 to 2025, considering the macro and micro environmental factors. The revenue generated from each component, specialty, and services was calculated by considering the telemedicine technologies and services market product sales. The report comprises an elaborated executive summary, which includes a snapshot that provides information about various segments of the market. It also provides information and data analysis of the market with respect to segments based on component, specialty, services, and country. The overview section of the report analyzes market dynamics such as drivers, restraints, and opportunities that influence telemedicine technologies and services market in the current and future scenario. The report also provides Porter’s Five Forces Analysis, the acquisitions timeline of the telemedicine technologies and services companies, SWOT analysis, regulatory scenario, key potential customers, funding deals in telemedicine technologies and services sector, reimbursement scenario, mergers & acquisitions, and comparative analysis of the telemedicine technologies and services market. Market share analysis among the players is analyzed to signify the contribution of these players in terms of percentage share. All these factors will help the market players to decide about the business strategies and plans to strengthen their positions in the global market. Based on country, the market has been analyzed for major countries: the U.S., Germany, the U.K., France, Italy, Spain, Russia, Sweden, the Netherlands, China, India, Australia, Singapore, Brazil, Saudi Arabia, South Africa, and Rest of the World. The study also covers detailed country analysis contributing to the telemedicine technologies and services market. The report also profiles major players in the market in terms of attributes such as company overview, financial overview, product portfolio, business strategies, and recent developments. Companies profiled in the telemedicine technologies and services market report are McKesson Corporation, F. Hoffmann-La Roche Ltd., Medtronic, Koninklijke Philips N.V., GE Healthcare, LifeWatch, Honeywell International, Inc., Aerotel Medical Systems Ltd., and GlobalMed, and AMD Global Telemedicine, Inc.